The island of Sardinia, with its Mediterranean atmosphere and charm, is beloved by visitors looking for an outdoor holiday with activities like swimming, boating, windsurfing, hiking, climbing, and camping. While Sardinia's near-perfect summer weather draws scores of visitors to coastal areas (at times overcrowded), the inner life of the island, away from the most popular vacation spots, remains largely unblemished by mass tourism and commercialization. Sardinia is steeped in history and has a colorful character quite different from the rest of Italy. This is where the ancient Nuragic society, whose stone monuments remain scattered across the island, flourished more than three millennia ago--predating the Etruscan civilization in mainland Italy by several hundred years. Sardinia's seaside resorts may be among the best in the world, but its quieter and more interesting countryside offers a greater array of attractions, including a patchwork of forests, citrus groves, and medieval villages. Cagliari: Explore impressive archeological sites from Carthaginian, Roman, and Byzantine times and enjoy romantic old-world charm in Sardinia's capital, Cagliari. Alghero: At the top of many travelers' Sardinia itinerary is Alghero, a popular port destination built around a 16th-century fortress with Catalan influences and gorgeous beaches. Palau: One of the most scenic forks on the northern coast of Sardinia is Palau, a destination full of beaches, boating opportunities, and rugged coastal views. Isola di Sant'Antioco: During your Sardinia vacation, consider visiting the region's second-largest island for its excellent beaches, local food, colorful piazzas, and ancient stone catacombs. Dorgali: Located in the Nuoro Province of Sardinia, Dorgali is a popular summer tourist spot full of charming villages and vineyards where some of Sardinia's greatest wines are produced. Maddalena Islands: With its buzzing cafes, waterfront attractions, and gorgeous nearby beaches, La Maddalena is the largest town in the Maddalena Islands--a small archipelago that is only reached by boat. Sassari: If you want to see cultural and artistic sights during your Sardinia holiday, head to Sassari, one of the island's oldest cities and home to lively piazzas, the Fountain of the Rosella, the Civic Theatre, and plenty of neoclassical architecture. Arzachena: Experience local culture and sun in Arzachena, a town in northern Sardinia renowned for its 80 km (50 mi) of lush mediterranean coast, including the world-famous Costa Smeralda resort. Nuoro: A haven for artists and art lovers, the hilltop destination of Nuoro offers a culturally rich town center, multiple museums, and views of Monte Ortobene as well as the valley below. Villasimius: Visit one of the island's most popular resort towns, Villasimius, to enjoy its southern coast, sandy beaches, and clear water. Frecce delle Grotte di Antonio Piccinnu: View ancient Sardinian dwellings via boat tour or on foot at Neptune's Grotto, a hidden seaside cave that can only be accessed by its steep stone staircase when the waters are calm. La Pelosa Beach: A natural paradise and haven for water sports enthusiasts, La Pelosa Beach is a Sardinian gem boasting white sands, shallow waters, and plenty of exploratory opportunities, including scuba expeditions and a 16th-century lighthouse. La Cinta: If you're seeking white sand beaches and clear waters for lounging, swimming, or something more active, add La Cinta Beach to your Sardinia itinerary. Poetto: The longest stretch of beach in the country belongs to Poetto, a popular Sardinia holiday attraction boasting white cliffs and 8 km (5 mi) of restaurants, bars, and even a summer cinema. Cala Brandinchi: Relax on one of Sardinia's famous pristine beaches, known for its super-fine sand, wild lilies, scenic dunes, and aquamarine water. Parco Nazionale dell'Arcipelago di La Maddalena: Admire the wildlife and beautiful terrain in Parco Nazionale dell'Arcipelago di La Maddalena, the only inhabited island in a protected archipelago. Parco Nazionale Asinara: Stroll the beaches and rocky cliffs of this national park on Asinara island, explore the area's unique history as a former quarantine zone and prisoner camp, and stop for lunch in its quaint fishing village. Le Bombarde: A forested cove with white sand and calm water, Le Bombarde is perfect for swimming, snorkeling, and enjoying views of paradise during your Sardinia vacation. Spiaggia di Tuerredda: This popular sunbathing and swimming spot is a Caribbean-style white sand beach with calm waters and a hilly backdrop, complete with a beach bar. Capo Testa: Walk the trails, explore the rocky terrain, and enjoy swimming in the sea at Capo Testa, a rugged strip along Sardinia's northern coastline. With so many beach towns, islands, and outdoor destinations, there is no shortage of Sardinia vacation ideas when traveling with children. The family-friendly beaches, parks, caves, and wildlife at Alghero make it a wonderful place to bring children, and teens will especially appreciate the water sports. The town of Cagliari boasts a long beach, an interesting historical center, and a countryside train ride that little ones will love. In Olbia your whole family can swim and sunbathe, head for a trek, or watch for dolphins on a boat trip. Oristano boasts water sports, sandy beaches, and birdwatching. Kids will love exploring caves, hiking, biking, and camping in Nuoro, or spotting mini horses around Iglesias, a town in the northwest known for its coastline and spooky mines. No matter where you choose to venture during your Sardinia holiday, you can be sure that natural beauty and plenty of engaging activities and attractions abound in every corner of this laid-back island. Beaches are generally a top priority for families on vacation in Sardinia, and it's hard to go wrong with so many options. Consider spending at least a day on one the island's famous beaches, such as La Pelosa Beach or Poetto. If it's a particularly steamy summer day, beat the heat at the island's biggest waterpark, Diverland. When you're ready to take a break from the sun and sand, Trenino Verde della Sardegna, escursioni, gite organizzate offers families the chance to weave through the region's rugged wilderness for a few hours or a longer loop. Take in the countryside for a full day, or keep it short if you have young kids. Frecce delle Grotte di Antonio Piccinnu is sure to fascinate visitors of all ages, though keep in mind these ancient caves can only be viewed when the water is calm and low. Experience the whole of Sardinia at your fingertips at Parco Sardegna in Miniatura, a miniature museum featuring the region's most prominent historical landmarks. Finally, if the opportunity presents itself, be sure to get silly and snap a picture or two next to the landscape's unusual rock formations like Roccia dell'Elefante. People from Sardinia love children, so you and your family should expect a warm welcome from many of the locals. When planning your Sardinia holiday, be sure to look at a few different hotel options and see which ones offer programming for kids, including clubs and day activities, as well as things like a kid's pool and restaurants with children's menus. If you prefer a more flexible, homey experience consider staying at a family-friendly bed and breakfast or renting a small home or apartment in the areas you're visiting. When planning your Sardinia itinerary, you may want to consider destinations with beaches marked by a green flag, which means they have been approved for children by pediatricians based on high standards of safety and cleanliness. These especially kid-friendly beaches include Poetto and the beach at Alghero. Finally, keep in mind that not all beaches have food stands or restaurants nearby--do pack snacks so that your kids don't get too hungry. Much like the rest of Italy, eating in Sardinia is about spending time with loved ones and breaking bread at a shared table. During your trip to Sardinia, you should expect to find traditional recipes that represent the different people who have passed through this island region. Locals typically eat flavorful, aged meats and cheeses along with "carasu," a wafer-thin bread, and pair them with homemade wine. More complex dishes vary based on your region, including the fregola pasta from Medio Campidano, lorighittas pasta served with sausage and tomato sauce from Oristano, and zuppa gallurese from Gallura, Sassari, and Olbia Tempio. During your Sardinia holiday, you'll find fresh fish and veggies across the island, as is typical in most Mediterranean countries, and classic meat pies called panadas. While shopping may not be the first thing that comes to mind when planning your Sardinia vacation, the island offers a number of opportunities to buy both local goods and designer items. Sardinia is famous for its fresh produce, but also for its wine and cheeses, which are easier to transport. Try (and buy) pecorino or casizzolu cheeses, olive oil, and precious saffron during your stay. Civraxiu bread is an Italian food that can only be found on the island, and mullet fish and nougat sweets here are quite distinctive. Find these goods and more at outdoor markets in Cagliari, Sassari, Oristano, and Carbonia. If you prefer high-end shopping more comparable to that of a European capital, head to Cagliari's Largo Carlo Felice and Via Roma streets. Other Cagliari shopping districts worth exploring include Vias Garibaldi, Manno, Via Dante, and Via Paoli. Sardinia, an Italian island in the middle of the Mediterranean, boasts a colorful history that blends a number of cultures, making it quite unique. Sardinia is home to the ancient Nuragic civilization, and is still dotted with archaeological sites and settlements from this time, including the famous Su Nuraxi Barumini. The current capital of the island, Cagliari, was actually established by Phoenicians around 1,000 BCE, and traces of this mysterious past can still be found throughout the city. It wasn't until the First Punic War in 238 BCE between Carthage and Rome that Sardinia became a part of the Roman Empire. While many Sardinians rebelled under Roman rule, the empire profited off of the island's land and had a major influence on the architecture, culture, and language of Sardinia. To see evidence of this on your Sardinia holiday, include a few trips to some of the island's Roman ruins, such as Anfiteatro Romano di Cagliari in the capital. After the fall of the Roman Empire, Sardinia was raided by pirates and colonized by a number of forces, including Pisa and Genoa. Most notably, however, was the Spanish rule of the island, which lasted nearly four centuries. At the end of the 19th century, Sardinia was at the center of the unification of Italy and the mainland used the island for its rich mining potential. However, in 1948 the region was granted autonomous status (which it still enjoys today) and began to expand its tourism industry. Now, instead of mines, travelers to these shores can enjoy the beautifully preserved nature in protected areas like Parco Nazionale dell'Arcipelago di La Maddalena, as well as the spirited mix of cultures and languages that make Sardinia unique. Sardinia is a mostly mountainous region in the Mediterranean Sea. Though it doesn't have high peaks, it still boasts a rugged and wild landscape that remains in tact despite its booming tourism. This territory is full of green woodlands, small desert-like areas, lush marshes, and, of course, world-famous beaches. The shoreline is covered in coves, like Frecce delle Grotte di Antonio Piccinnu, fine white sands, and sea cliffs reaching out to aquamarine water. Some of the island's most well-known beaches are also its most beautiful, including Poetto and Le Bombarde. If your prefer finding things to do in Sardinia further inland, head to Gennargentu Mountains, the region's largest mountain range. You can also check out Nuragic complexes specific to the region, such as Su Nuraxi Barumini. Sardinia is a region that is known for celebrating religious holidays and cultural festivals year round, usually with a parade or procession, traditional food, Sardinian dress, and live music. If your Sardinia vacation falls in May, you may encounter Cavalcata Sardo, which many consider to be the island's most lavish parade. Sardinia has been putting on this colorful spring festival with hundreds of people in costume since 1899, and it still remains a favorite of locals and tourists. The three-day San Bachisio Festival features poetry and dancing, the S'Ardia Festival is a religious procession with equestrian races and competitions, and the Sant'Agostino Festival marks the end of summer with a parade, fireworks, live entertainment, and more. 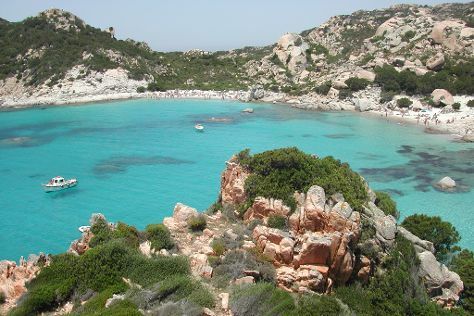 The most popular time for a trip to Sardinia is undoubtedly summer, when the coastal temperatures average 28.5 C (83 F). The island's coast experiences a Mediterranean climate year round, while the interior has a continental climate. You can swim in Sardinia's gorgeous waters from May to October thanks to the long, hot summers that warm the sea. That said, there isn't really a bad time to visit: January, the coldest month, sees temperatures around 11 C (58 F), and it only snows in the highlands. Expect 135 sunny days per year and potential rain in the autumn and winter. Get to Sardinia by plane via one of the airports near Cagliari, Olbia, or Alghero, or by ferry services which connect to Cagliari, Porto Torres, Olbia, Golfo Aranci, and Arbatax. Once you have arrived on the island, you can use buses or trains to get around. Buses are more convenient, while trains are typically less expensive. Bus lines connect most major towns, although expect delays and infrequent service. Renting a car may be worthwhile, particularly if you want to visit more remote areas during your tour of Sardinia. If you prefer to take a scenic route, consider Trenino Verde della Sardegna, escursioni, gite organizzate, touring the island on sailboat or chartered yacht, or renting a bike and cycling along the well-maintained roads with spectacular views. Although many people in Sardinia speak the national language, Italian, with a specific accent, locals also use dialects of Sardu (Sardinian). Sardinian is not an Italian dialect but, rather, its own Romance language. Other minority languages spoken include a local version of Corsican called Gallurese, Sassarese (a dialect between medieval Tuscan and Sardinian), Algueres (Catalan), and Tabarchin (a Ligurian dialect). In some of the larger cities and popular tourist resorts, you will find people who speak English, though this is not as common in the countryside. For that reason, you may want to bring a small dictionary or phrasebook on your Sardinian trip.